To challenge and enhance your capabilities, fast-track your career, and become an agent of global development, take your next step at Purdue University. A Purdue Master of Science Degree with a major in Finance (MS(F)) will unlock countless opportunities throughout your career by distinguishing you among your counterparts. At Purdue, you’ll have the opportunity to build worldwide relationships, identify your career path, and transform a quantitative education into the ability to drive results. The MS(F) program draws on real-world applications and access to the top minds in finance, complementing studies in the classroom to create a holistic learning experience. These intensive studies will further develop your abilities in critical thinking, analysis, and problem solving. Working in a team-based environment, you’ll study alongside top students from the United States and around the world. You’ll grab coffee with your classmates from Indiana and Colombia; prepare for a group presentation with your Taiwanese teammate. After your year at Purdue, your global cognizance will be enlightened. The Purdue Master’s in Finance is tailored to foster your individual aspirations. For a competitive edge for careers in corporate finance; investment management; security analysis and brokerage; commercial and retail banking; and financial management of commercial and nonprofit organizations, choose a MS(F) degree from Purdue. STEM Classification Announcement: The MS Finance program is a STEM certified program (for details regarding the associated STEM OPT extension, please visit the USCIS website). International students must be able to prove documentation (diploma or degree certificate indicating a degree conferred and date received) for a 4-year degree to be eligible to enroll in the MS(F) summer semester. 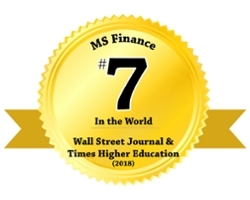 MS Finance News: Purdue University’s MS Finance program has been ranked #7 in the world by Times Higher Education / Wall Street Journal. Want to know even more about Purdue Finance?